Assam chief minister Sarbananda Sonowal on Monday distributed appointment letters to 341 candidates selected for the posts of junior administrative assistants and computer operators at secretariat at a simple programme held at Srimanta Sankardeva International Convention Centre here. Altogether 174 junior administrative assistants were selected after a rigorous selection process from 40 thousand applicants and 167 computer operators from 75 thousand applicants. 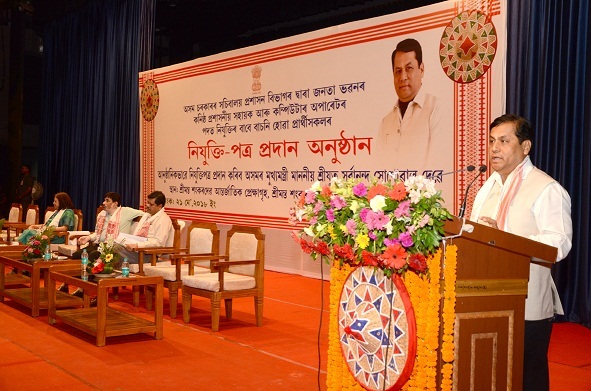 Speaking on the occasion, chief minister Sarbananda Sonowal said the transparent selection process adopted for appointing the junior administrative assistants and computer operators with merits as the sole selection criterion is the corner-stone of people’s democracy. Sonowal said, “We are committed to work with honesty so that people at every level can have access to honest and just treatment of the government”. The chief minister said Dispur is the epicentre of all administrative exercises and the people from 33 districts come here to get their work done. However, a good treatment meted out to the people who come to Janata Bhawan from far flung areas, generates people’s faith in the administrative system. He at the same time urged the junior administrative assistants and computer operators who constitute an important segment of service delivery system to treat the visitors of Janata Bhawan humanely and transparently so that the grievance of all can be met. He also said honesty, transparency, trustworthiness are the hallmark of the present dispensation in the state which were elusive during the previous government’s regime. The selection process of the junior administrative assistants and the computer operators and dependence on merits as the sole criterion for appointment bore the testimony of the present government’s honesty and transparency. Terming that work culture is the king of all culture, Sonowal urged upon the new appointees to work diligently, redress the grievances of all and sundry and extend their cooperation for the government’s relentless pursuit of weeding out corruption from the system. Chief Secretary TY Das who also spoke on the occasion congratulated the new recruits and asked them to work resolutely to make ‘work is worship’ their motto. Chief Minister’s Media Advisor Hrishikesh Goswami, Principal Secretary to Secretariat Administration Department Jishnu Baruah and several senior officers and dignitaries were present on the occasion.